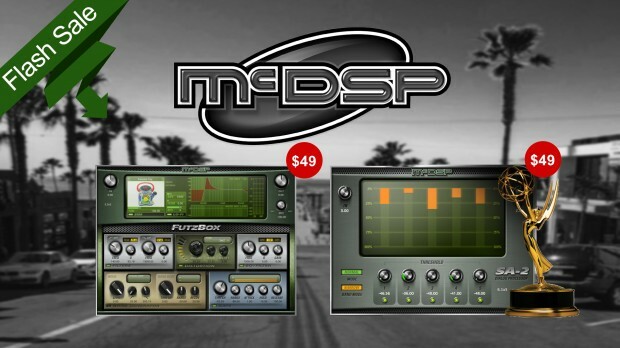 McDSP Weekend Flash Sale starts tomorrow the 16th of November on the FutzBox and SA-2 Dialog Processor (Native: $49 | HD: $69) and continues until November 19th. FutzBox is a distortion and noise generator plug-in for creating low fidelity versions of audio signals. Typical post productions require distorted, or ‘futzed’ versions of dialog and other tracks. Simulations of radios, cell phones, and televisions are now available in a single software product. These simulations, called SIMs (Synthetic Impulse Models) provide accurate modeling in an extremely optimized format, allowing FutzBox to use less DSP power than conventional convolution based products. Furthermore, SIMs can be scaled in real-time and changed on the fly. The SA-2 Dialog Processor is based on hardware originally conceived by Academy Award winning re-recording mixer Mike Minkler and used on over 100 major motion pictures. The SA-2 is designed to improve the overall sound of recorded speech. But the SA-2 is not just for dialog. It’s equally useful for vocals, and is a great tool for adjusting the timbre of any track, a reliable de-esser, and a fine multi-frequency compressor, in McDSP’s completely biased opinion. This entry was posted in DontCrack, Plug-ins, Promotions, Uncategorized and tagged de-esser, dialog processor, Distortion, FutzBox, McDSP, McDSP Weekend Flash Sale, multi-frequency compressor, noise generator, SA-2 Dialog Processor. Bookmark the permalink.